The Appaloosa is one of mother nature's very special creatures. as all degrees of contrast to those colors. The Appaloosa often comes equipped with color changing capabilities. What you see today, may differ tomorrow. to be offered a full and complete color chart. yet it is our generation which was the first to offer a breed registry. The Appaloosa is not a product of image breeding. Any image set forth would only be used to improve on. The Appaloosa is a special joy to breed, break, train, and ride. He is the common denominator between nobility and just people; the wealthy and the poor; the famous and the unrecognized. He is a diplomat, bringing all groups together. The Appaloosa is the answer to many of America's problems. Her youth who ride them do not have to wonder who they are or where they are going, for the Appaloosa brings about an understanding of nature, love, respectability and responsibility. He stands as an example of family cooperation offering himself to any household that has a need for close fellowship. The Appaloosa is attracted to movies, television, big people, little people, and old people. Most of all he is attracted to beautiful young ladies who in turn attract fine young men who are given the privilege of holding, brushing, leading and cleaning stall for that young lady's "Noble Appaloosa." The Appaloosa is a creature of dreams. One may dream a full year as to the possible color of a new foal. SOME DREAMS COME TRUE. The Appaloosa is a King Maker. One has to only pull on a pair of Wranglers, cowboy boots and a cowboy hat; then mount an Appaloosa to become KING. The Appaloosa is America's West. He is Indian, Cowboy and Rancher. He represents America in its most colorful period. He is a privilege to touch - a special privilege to own. my friend, when you enjoy the privilege of his association. 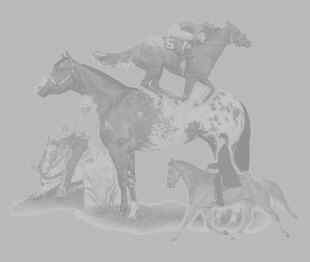 go to the Appaloosa Horse Club web site.